In “Girl Detective” she solves the case of the missing diamond and uncovers the truth about an awfully nice teacher. And right after that, Friday gets arrested and that’s what the second book is about, “Under Suspicion”. Oh and if an 11-year-old girl being arrested for being accused (by her love interest/nemesis, Ian Wainscott) for keeping illegal substances in her HOCKEY STICK, well Highcrest academy also unknowingly allowed a hardened criminal to enter its premises and even become a student for a whole term! Friday’s time at Highcrest is certainly full of chaos, including someone being kidnapped by their own father! This book is such an entertaining read and I would definitely recommend it for kids who love reading about love and mystery. 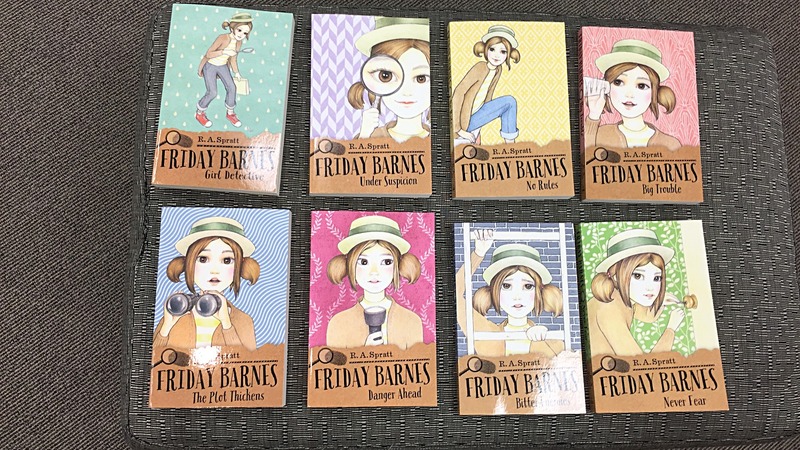 R.A Spratt really outshined herself with the Friday Barnes series!